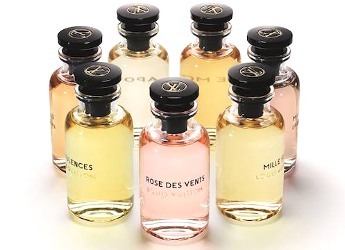 Louis Vuitton will launch Les Parfums Louis Vuitton, a new collection of seven fragrances for women. Les Parfums Louis Vuitton were developed by perfumer Jacques Cavallier and will be fronted by French actress Léa Seydoux. 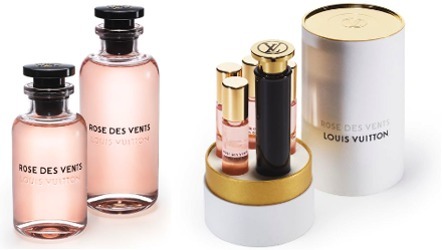 Rose Des Vents ~ a sparkling floral with rose, iris and cedar. Apogée ~ a delicate floral with lily of the valley, rose, magnolia, jasmine, guaiac wood and sandalwood. Turbulences ~ a heady floral with tuberose, jasmine, magnolia, rose and leather. Dans La Peau ~ with leather, musks, jasmine, daffodil and magnolia. Les Parfums Louis Vuitton will debut in September, in 100 and 200 ml Eau de Parfum. There will also be travel sprays (four x 7.5 ml) and a limited edition set of miniatures (seven x 10 ml). A Louis Vuitton suitcase to hold three 100 ml bottles will be sold separately. Update: the information above in brackets is via Women's Wear Daily. Prices will be 100 ml ($240 ml or $150 for a refill), 200 ml ($350 or $300 for a refill), travel spray set ($240), miniature set ($240), leather suitcase ($4900). I wonder if the perfumes will be in a special room without the bags as it would be unfortunate for the bags to be contaminated with perfume, seeing as a good portion of the shoppers seem to be of ethnicities that are notorious for wrinkling their noses at perfumes. They will certainly cost enough to have their own room. The only price I’ve seen so far is $240, which is from Harper’s Bazaar but they don’t say which size. I suspect it’s for the 100 ml. 100 ml is $240 with I think $150 for refills. 200 ml is $350 with $300 for refills. Travel set with spray is $240, with the refill set being less. Minis are $240 as well. Honestly, I’d been a bit skeptical on these, especially at this price point, but I seem to be getting more and more excited as the launch gets closer (just want they want, I’m sure). Then again, I did grow up on L’eau d’Issey, so that may have a little to do with it. Coming from a huge LV fan who’s also a cynic, I get the feeling the fragrances will be nice and generally likeable, but nothing particularly audacious with the bulk of the price being the LV mark up. That being said, I’m excited for the set of miniatures too. Fragrances either need to be incredible or under $50 for me to be willing to buy a full bottle. It is very nice that they’re doing the minis. Hope they aren’t so limited edition that they’re hard to find. I´ve got my sights on that set! Ha, better wait and smell! But very glad to see they are doing mini & travel sizes. I’m incredibly thrilled by yet another collection with a rose, an oriental, a leather …. And at such a compelling price point! Must be very good, clearly.